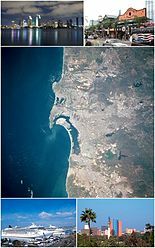 Tijuana (Inglis pronunciation: /tiːəˈwɑːnə/ tee-ə-WAH-nə or /tiːˈwɑːnə/, Spaingie: [tiˈxwana]) is the lairgest ceety on the Baja California Peninsulae an centre o the Tijuana metropolitan aurie, pairt o the internaitional San Diego–Tijuana metropolitan aurie. An industrial an financial centre o Mexico, Tijuana exerts a strang influence on economics, education, cultur, airt, an politics. As the ceety haes become a leadin centre in the kintra, so haes the surroondin metropolitan aurie, a major industrial an paramount metropolis in northwastren Mexico. Currently ane o the fastest growin ceeties in Mexico, Tijuana maintains global ceety status. ↑ Tijuana, entry in the American Heritage Dictionary of the English Language, 4th ed., 2000. Transcribed into IPA. ↑ 4.0 4.1 Walker, Margath (January 2011). "Knowledge production and border nationalism in northern Mexico". Nations and Nationalism. 17 (1): 168–187. doi:10.1111/j.1469-8129.2010.00461.x. ↑ GaWC. "The World According to GaWC". Retrieved 2011-02-26. 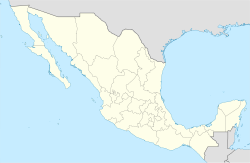 ↑ "Mexican Sister Cities". Sister Cities International. Retrieved May 1, 2011.